Whenever we think of art, we are lost in drawing out what we find beauty in. Some people draw nature, some draw their emotions and the fortunate artists draw their lives. The Ancient Indian art forms have been on passage from one generation to another. The Indian folk art which depicts various forms is still alive in many parts of the country. India as a country is culturally diverse and distinct. It has resulted in a variety of art forms evolution over the years. Some are still untouchable zone by modernisation. Some are trying to adjust to new paint colors and materials. Still, each depicts religious epics or Gods. They’re all unique, admirable and inimitable in their own way. During the days of yore, they were made with natural dyes and colors made of soil, mud etc. All that helped in giving it a sense of antiquity and vintage nostalgia. Here’s a list of Top 5 Ancient Indian art forms that still persists in many parts of India! #1 Top Ancient Indian Art Forms: Another name of the Madhubani is Mithila art. It came into the picture in the kingdom of Janak earlier situated in Nepal and present-day under Bihar. 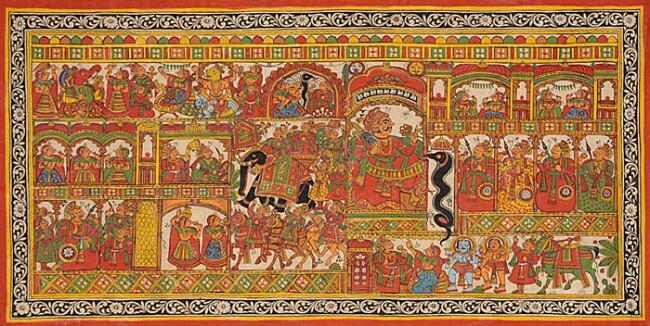 Also, it is one of the vibrant and popular Indian folk art forms. It is duly in practice mostly by women who are in search of union with God. It is characterized by geometric patterns. Though this art form wasn’t in light to the outside world until its discovery by Britishers. They came to know about it after an earthquake in 1930’s revealed broken houses with Madhubani paintings. It was the match of the standards of the work of Picasso and Miro, according to William G. Archer. All the paintings or wall murals depict gods, flora, and fauna related to this art form. #2 Top Ancient Indian Art Forms: Origination of this piece of art was in the Mughal era which was highly under the influence of Persian style. The intricate details and acute expressions but in a miniature size. This art form basically flourished during Shah Jahan’s and Akbar’s rule. This piece of art is now popularly practiced in Rajasthan. It was also adopted by the Rajputs. The paintings under this art form more or less deeply religious symbols and the epics of the ancient era. They stand out since the women portrayed in these paintings have large eyes, a pointing nose, and a slim waste. Description of men is mostly with a turban. #3 Top Ancient Indian Art Forms: This art form originated in 2500 BC. It came into the picture by the Warli tribes from the Western Ghat of India. This is one of the oldest art forms of India. The main geometry used to draw such adorable paintings were circles, triangles, and squares which led to numerous shapes that depicted daily life activities like fishing, festivals etc. A circle and two triangles defining human is the most vital thing in these painting and are the points that set it apart. The painting was done mainly on a red ochre or a dark background. The shapes were white in color. #4 Top Ancient Indian Art Forms: This art form is characterized by the sense of belonging with Nature. The Gondi tribe in Madhya Pradesh were the creators of these bold, vibrantly colored paintings that mainly depicts flora and fauna. The beautiful colors are from the extracts of charcoal, cow dung, leaves and colored soil. If you look closely, you would be able to identify that these paintings are put to creation by just dots and lines. In this modern era, these styles are in imitation with acrylic paints. Also known as the evolution of the Gond art form. Jangarh Singh Shyam was the most powerful artist who received an award in the 1960s. #5 Top Ancient Indian Art Forms: It originated in the 19th century. The creators were the people of Kalighat, Bengal. It is one of the recently discovered painting styles. It came into the picture in that time of the British era where all possible efforts were put into upheaval the Britishers. These paintings earlier were in depiction to the epic of gods and goddesses but in transition into the depiction of social reforms. This art form was in characterization by brushwork, flawless strokes and bold drawings. Cheap paper and paint colors, as well as the squirrel hair brushes and color pigments, were in use to draw such paintings. It always raises awareness about the society to its viewers through the adorable art. The rich zamindars were in depiction to drink wine with women. It draws the policy babus being sloppy and the priests who use to ‘unchaste’ women. Thus this description gives light upon the ancient art forms which need a wake-up call from the modern era artists. They can use them for enhancing the beauty of their art. We use art not only to give others peace but also to show the social reforms happening around the globe.